Now that I have come back down to earth after Sunday's flight of fancy I have a few photos to share with you. are winging their way to Anne in Indiana. Isn't this the most adorable colourway! The picture doesn't really do it justice the colours are far more subtle. I was three little 20g skeins of 100% merino that I bought off a lady on Ebay. She dyes it herself and calls this one Sorbet. 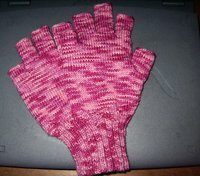 It reminds me of raspberry ripple icecream, now fingerless gloves for Dancing Daughter. These were the gloves knitted on my new 5" clover bamboos. First of the Christmas knitting finished! These are for my dad, they are going to be like christmas stockings stuffed full of goodies. They are the grey Opal Rodeo colourway. Very subtle and manly I thought. Finally here is the best of a very bad bunch of photos of the first 33 rows of Frost Flowers and Leaves. I tried with flash and without. Flash photos you couldn't see the detail, without flash the shutter time was so long it is slightly blurred but hopefully you get the idea. The sorbet colourway is lovely! All lovely. And especially Frost Flowers and Leaves! You have been a busy little knitting bee. 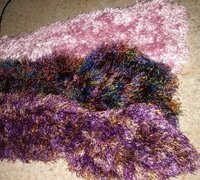 Wonderful items to make people warm this year! Thanks for joining us, Janine. 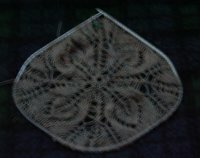 Frost Flowers is such a gorgeous shawl! Can't wait to see it grow. The Frost Flowers will be fantastic. What yarn are you using for it? ?